Please note that any LED turn signals draw a smaller current than most standard fitment ones and will need suitable flasher relay (part number TELC-0001) in order to flash at the correct speed. If fitted with rear LED turn signals, only one flasher relay TELC-0001 required for one bike. 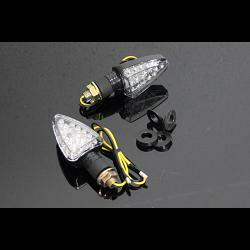 Notify me of updates to Mini LED turn signal lamp kit, Universal, Front Fairing.